“Where’s the shark?” asked the Horror from Outer Space through his snorkel. “Where’s the shark where’s the shark where’s the shark AAAAARGH!” he said, while executing quite a fine example of an underwater leap. The Casey family snorkelled with a shark today and it was exactly exciting enough. It was almost the same length as the Horror, and kept swimming in figure eights under us, but didn’t go snapping at our fins or tearing any marine life apart. We got the kids on board the Silver Sonic this morning after some very fast talking and extreme applications of the placebo effect. They were worried that they were going to be sick again if they got on a boat. Of course, so were we, but we weren’t telling them that. I went to the trouble and expense of brewing some ginger tea with local ginger purchased at Rusty’s Markets in Cairns and some palm sugar I found at an excitingly comprehensive Asian supermarket. For a sample recipe, please see my previous blogs. This morning we all had some, though the kids complained it was too strong. Of course, I told them, medicine has to be strong to work properly. I thought it was excellent, and believed my own propaganda. 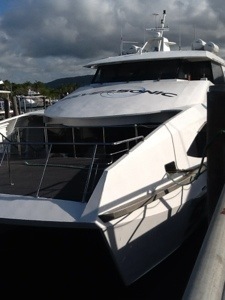 Just in case, everybody except me took some Travacalm as well before boarding the rather swish Silver Sonic at Port Douglas. The promised rough ride (shut up! I kept thinking) wasn’t at all, but the kids rode outside at the front just in case. As an additional precaution, the Moose danced Gungnam style the whole way too. Whatever, it worked. It was the best snorkel yet. We stopped at three different reefs, all with beautiful coral and very clear water. Our Japanese snorkel guide promised us “many Nemo and Giant Crams”, and he was right, both before and after runch. We even saw a moray eel, possibly, just so the Moose could say “that’s amore … eel”. The last stop was at Turtle Reef, so called as our disappointingly non Japanese snorkel guide said “we very occasionally see turtles here”. We didn’t, but it was still spectacular. All in all, I think the shark was the highlight. Are we done snorkelling? We’re now into family reunion mode, so it’s out of our hands, but if so, we’ve done good.